I’ve been keeping a a secret for the last 5 months or so. But, I’m happy to say I can finally fill you in!!!! Earlier this year I was approached by a group of entrepreneurs who wanted to re-imagine the future of content and commerce and then use those learnings to re-launch the Condé Nast title domino. The vision was that the new domino would still be a printed magazine, but also would be a website that elegantly integrated the beautiful editorial from the print magazine and made the products from the editorial shoppable –right from domino.com. For the last 5 months I have been working with the domino team to figure out how to maintain the integrity of the editorial while weaving in opportunities for readers to actually purchase products they might be interested in. It has by far been one of the most exciting projects I’ve worked on!! I love to solve big problems, and this has definitely been a huge undertaking! The problem that I see today with the rise of companies who try to tackle the opportunity of content & commerce is that no one has really done a great job at creating an experience for the reader that establishes and maintains context. This is really just the beginning as we continue to explore what context means for commerce and content. I’m thrilled to be able to work alongside such a great team — and having amazing quality content also makes my job a bit easier! The website, domino.com went live this past week and there were some great articles in the New York Times, TechCrunch, AdAge, DesignSponge, and The Editor At Large responding to the relaunch of the magazine and the integration of the digital component. 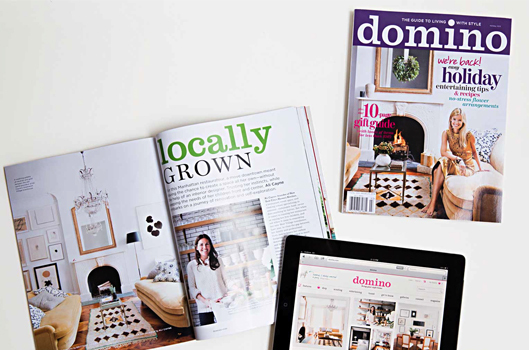 If domino can pull it off, they will have written the playbook for how magazines should integrate e-commerce. Stay tuned for more of my insights from designing the experience of domino.com and the challenges, opportunities, and lessons I’m learning about user experience, content, commerce, and most important of all … context.